I honestly can't tell you how excited I am that I can finally share this awesome project AND I get the chance to do this every month alongside my very talented team mates Jaine and Claire. How fab is that? But hang on that's not all, you can join in the fun too, yay! Before I get onto the how, I want to start off with the WHY I created this particular layout for January. Personally I think it's the perfect time to reflect on the year gone by and I take from that how I want to see myself in the new year. So this year I have decided I want to SPARKLE and with plans in place already, I hope to achieve just that. Exciting times ahead! 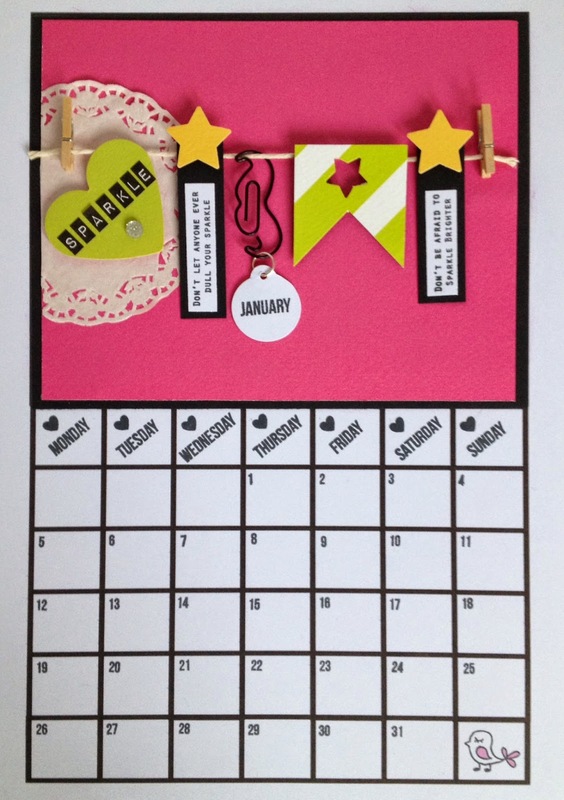 1 - Download and print out the free calendar template from Sarah's shop. 2 - Using Sarah's new calendar stamp set that she designed for this profect, stamp the days of the week diagonally across each box, on the top row. 3 - Next stamp the small heart image above the text. 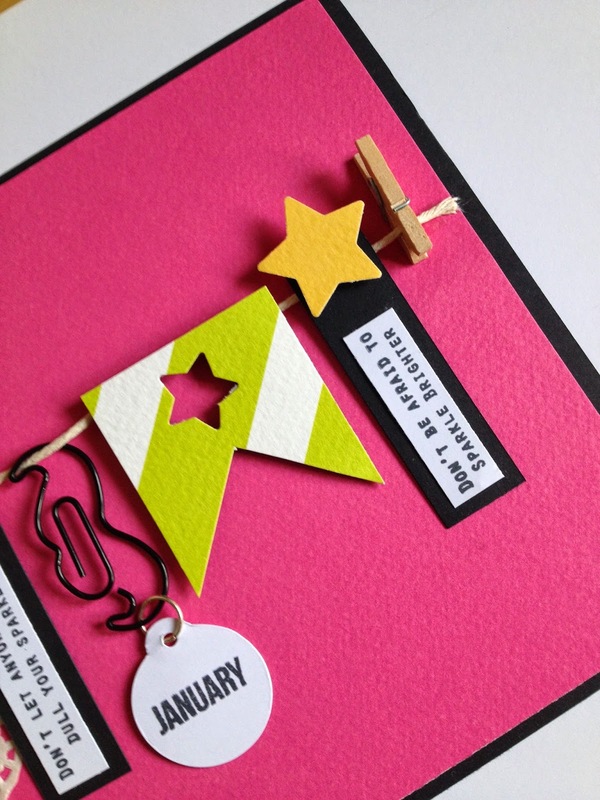 4 - Take the number stamps and use these to create a box for every day of the month of January. Starting on Thursday stamp from left to right, working your way down the page. You should now have 3 empty boxes on the left hand side of the second row and one empty box at the far bottom right. 5 - The first three boxes I want to keep free for adding notes later but the the bottom box I wanted to fill with Sarah's cute little bird stamp. I got this from one of my 'A Few Of My Favourite Things' kit. 1 - Mat and layer pink and black card stock. 2 - Cut one of Sarah's doilies and stick to the left hand side of the pink card. 3 - Pop two mini wooden pegs through some parcel string and stick down. embellishment place at the bottom. 5 - Next stamp out two sentiments onto white card then mat and layer them onto black card. Punch a star from yellow card then add foam squares to the back before sticking down. 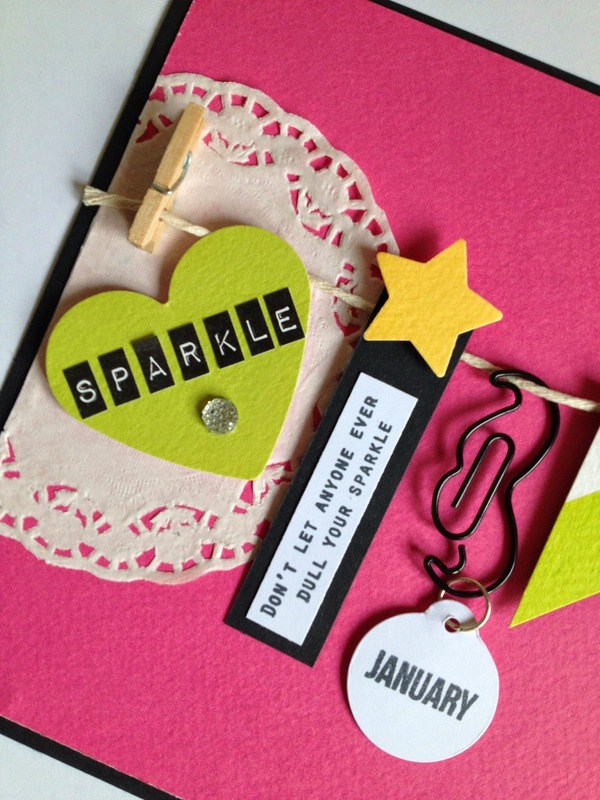 6 - Using white card and a Tim holtz die, create a round tag, then stamp the January sentiment in the middle. Attach the tag to Sarah's moustache paperclip using a jewellery jump ring. 7 - Now arrange along the string line and stick down. 8 - Finally adhere double sided tape to the back of the layout and attach to the calendar template. Here's a close up of the layout. shopping time....just click for a direct link to Sarah's shop. Fab Clare, lovely and vibrant. What a great start to an exciting project.